Claddagh Rings Custom Made, Sapphire Claddagh Ring. Claddagh Rings Custom Made, High End Craftsmanship Sapphire Claddagh Ring. Claddagh Rings, High End, Hand Finished Claddagh Ring. 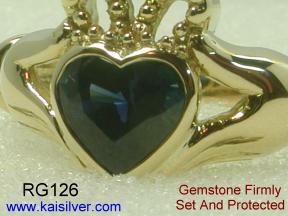 Sapphire Claddagh Ring Or Any Other Gemstone Of Your Choice. Claddagh Rings Have Much Deeper Meaning That Goes Beyond Other Gold Or Silver Rings. 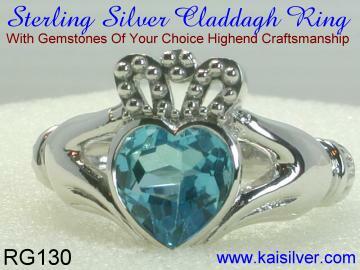 Kaisilver Has Created The Ultimate Claddagh Ring With The Finest Craftsmanship And High Grade Gemstones. Our Designers, Craftsmen And Gemstone Experts Have Spent Months Thoroughly Understanding The Significance Of Claddagh Rings, Irish Traditions And Beliefs Were Understood And The Final Rendition Of The Claddagh Ring That You See Is Undoubtedly The Best You Can Ever Find. Leaving The Essence And Sentiments Untouched, We Have Transformed This Claddagh Ring Into Something Special, Spectacular And Mystical. Flawless Craftsmanship, Premium Grade Gemstones And Handfinishing Of Each Piece By Skilled Craftsmen Has Resulted In A Claddagh Ring That Looks Modern, Stylish And Still Stays Firmly Rooted In The Deeper Meaning Of The Claddagh Ring. Custom Made Claddagh Ring With Gold And Gemstones Of Your Choice. Claddagh Rings Are Also Popular As Irish Wedding Rings. With A History That Dates Back To Over 300 Years, Claddagh Rings Are Named After An Ancient Fishing Village By The Same Name In Ireland. Modernisation Has Snatched The Natural Beauty Of This Old Fishing Village But The Significance Of The Claddagh Ring Lives On. The Mother Presents Her Claddagh Ring To Her Daughter On The Daughter's Wedding Day. The Popularity Of The Claddagh Ring Now Extends Far Beyond The Small Fishing Village Or Ireland. The Ring Is Worn All Over The Globe Probably As The Symbol Of Love, Friendship And Loyalty That It Represents. The Increasing Violence And Obscenity That We See In Society Is Due To The Diminishing Existence And Belief In The Three Virtues Of Love, Friendship And Loyalty. What Does The Claddagh Ring Mean. Unlike Other Gold And Silver Rings Worn For Mostly For Style And Fashion, Claddagh Rings Are Full Of Meaning With Every Aspect Of The Ring Signifying Something Special And Meaningful. The Hands Signify Friendship, The Clasped Hands Are Extended In A Show Of Friendship And Brotherhood Of Mankind. The Heart Shows Love, An Extension Of Friendship Love Means Caring And Helping Each Other. Finally Comes The Crown On Top Of The Heart, The Crown Means Loyalty. Ironically, Though The Claddagh Ring Has Become Far More Popular In Recent Times, The Three Virtues Of Friendship, Loyalty And Love Are Slowly Diminishing In Our Modern Society. This Claddagh Ring Like All The Other Jewelry On Our Website Can Be Modified As Per Your Preference. You Can Even Send In Your Own Digital Images For Us To Custom Make. The Ring Can Be Ordered As A White Gold Claddagh Ring Or A Yellow Gold Claddagh Ring. We Can Even Custom Make A High End Sterling Silver Claddagh Ring For You. You Can Choose The Gemstones Of Your Choice. Design Variations For The Claddagh Ring. One Cannot Expect To Find Drastic Changes And Modifications In The Case Of Claddagh Rings, The Deep Rooted Traditions And Meanings Should Be Intact For A Ring To Be Called A Claddagh Ring. The Earlier Claddagh Rings Were All Made Of Sterling Silver Without Gemstones. As Times Changed And The Ring Got Popular, People Were Willing To Pay Much More For Their Irish Traditional Claddagh Ring. Then Came The Gold Claddagh Ring In White Or Yellow Gold. Gemstones Started Being Used And Even Those Gemstones Were Selected To Match The Birth Stones Of The Person Who Wore The Ring. In One Variation Was The Claddagh Ring Without The Crown, This Is Still Made By Many Jewellers And The Designs Are Highly Modified At Times. Then There Was A Period Around 100 Years Ago When The Two Hearts Claddagh Ring Hit The Markets. This Claddagh Ring Had A More Direct Reference To Love And Friendship. The Double Hearted Claddagh Ring Is Now Not Very Popular. 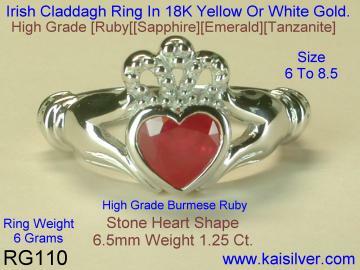 Kaisilver Can Custom Make Both Variations Of The Claddagh Ring, The One Without The Crown And Also The Claddagh Ring With Two Hearts Can Be Made To Order. You Can Select The Gemstones Of Your Choice. Other Names For Claddagh Rings: The Claddagh Ring Has Now Gone Global, The Same Ring Is Now Referred To By Different Names. The Hands And Heart Rings Are One Of The Common Names Given To The Irish Cladagh Ring. We Mentioned Above That Subsequent Variations In The Design Introduced A Claddagh Ring With Two Hearts And This Brought About The Name Double Hearts Ring. With The Perfect Reference To Love And Friendship This Ring Could Also Be Referred To As A Heart Ring. This Ring Would Make A Classic Valentine's Day Or Mothers Day Gift. Gift It To Someone You Love. Order It As An Engagement Ring, Wedding Ring Or An Anniversary Ring. With The Complete Range Of Gemstone Options You Are Bound To Get A Perfect Claddagh Ring With Gem Stones To Suit Your Taste And Budget. Clladdagh Rings Gemstone Options. The Gold Claddagh Ring Or Claddagh Ring In Sterling Silver Can Be Made With Gems Of Your Choice. However The Gemstones Generally Used Can Be Classified As Per Their Price Range. The Lower Price Range Gems Would Include Claddagh Rings With Red Garnets Or An Amethyst Claddagh Ring In Gold Or Sterling Silver. Topaz Claddagh Rings Using White Topaz Or All Shades Of Blue Topaz Would Also Look Gorgeous. If Yellow Is Your Choice Then White Gold Or Yellow Gold Claddagh Rings With Citrine Gems Would Be A Good Choice. Green Gemstones In This Price Range Would Include Silver Or Gold Peridot Claddagh Rings. A Black Onyx Claddagh Ring Or A Turquoise Gemstone Claddagh Ring Can Also Be Included In This Gemstone Price Range. Green Jade Claddagh Rings Or A Cladagh Ring With Lavender Jade For The Center Can Also Be Made To Order. In The Medium Price Range Gemstones For Your Claddagh Gem Stone Ring In Gold Or Silver Would Include An Aquamarine Claddagh Ring Or A Green Tourmaline Claddagh Ring In Yellow Or White Gold. Another Gem Stone In This Price Range Would Be A Pink Tourmaline Claddagh Ring. Light Pink Kunzite Gemstones Would Make Gorgeous Kunzite Claddagh Rings. However Please Keep In Mind That Kunzite Gems Fade In Color As Time Passes By. Opal Claddagh Rings Seem To Be Getting Popular In Recent Times. A White Opal Claddagh Ring, Or A Claddagh Ring With Fire Opal Gemstones Can Also Be Custom Made. For Both These Opals Consider A Yellow Gold Claddagh Ring With Opals. The Claddagh Ring Can Also Be Made With Your Birth Stone. The Belief And Popularity Of Birth Stone Rings And Other Birth Stone Jewelry In Recent Times Is Visible. Basically, There Is A Gem Stone Associated For Every Month And Zodiac Sign Under Which A Person Is Born. You Can Have A Claddagh Gold Or Silver Ring Made With Your Birth Stone. This Would Give Added Meaning To Your Claddagh Ring. Click Here For Birthstone Information And Charts. There Are Also Alternate Birth Stones Available. So Make Your Selection Depending On Your Likes And Budget. Craftsmanship In A Claddagh Ring. 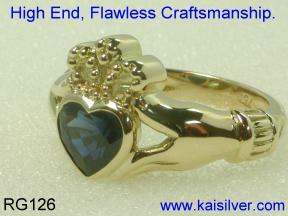 All The Jewelry Made At Kaisilver Is High End Craftsmanship. 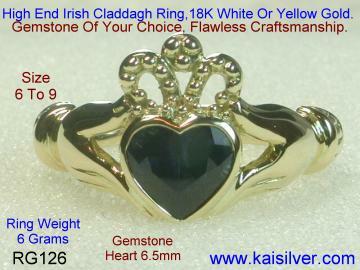 When You Order Your Claddagh Ring From Kaisilver You Will Not Be Buying Just The Ring But Rather Draw Upon Our Entire Resources Of Skilled Craftsmen, The Best Gemstones That Your Money Can Buy And A Design That Will Be A Masterpiece. The Healthy Gold Weight Ensures That Your Custom Made Claddagh Ring Lasts For A Long Long Time. Notice, How The Gemstone Is Mounted In This Claddagh Ring. The Entire Border Of The Heart Shaped Gemstone Is Covered With Gold. This Gives The Gemstone A Firm And Sturdy Setting. There Are No Compromises Made In Designing And Making Of This Claddagh Ring. After The Casting Of The Ring Is Done It Is Handfinished To Perfection, By Some Of The Best Jewelry Craftsman In The Trade. Individual Attention Is Paid To Every Detail. Notice The Clarity Of The Hands And Fingers. Also The Mounting Of The Gemstone With A Neat And Tidy Gold Border. Kaisilver Has The Strictest Quality Controls And Thorough Inspection Is Done At Every Stage. Rework Is Done Whenever A Flaw Is Noticed, The Gemstones Are Handpicked And Handcut. 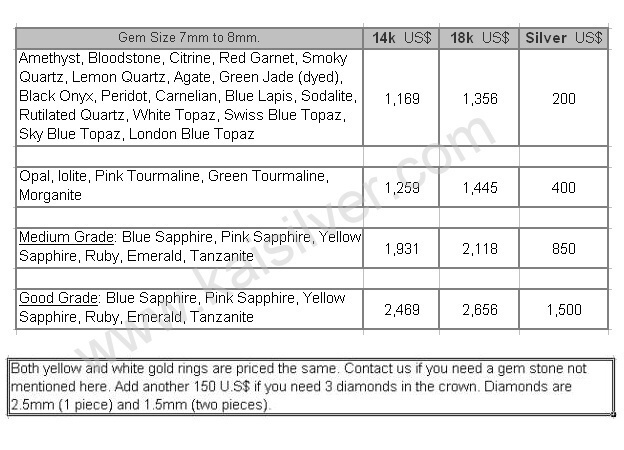 The gemstone size ranges from 6mm to 8mm and you can see the details in the table below. The prices mentioned do not include diamonds in the crown. If you need diamonds, please add another 150 U.S$ to the price. The diamonds are genuine round diamonds of size 2.5mm (1 piece) and size 2mm (2 pieces) and are set in the crown. Another Stunning Claddagh Ring In The Medium Price Range. Gemstone Options Include White Topaz, Blue Topaz, Amethyst, Citrine, Red Garnet, Black Onyx, Blue Turquoise For This Claddagh Ring. Click For Details Of This Made To Order Claddagh Ring. High End Ruby Claddagh Ring In White Or Yellow Gold. Gemstone Options Includes All Gemstone Options. Click For Information On This Custom Made Cladagh Ring. Sterling Silver Claddagh Ring Highend Craftsmanship. Click For Information On This Sterling Silver Claddagh Ring. Shipment Will Be Made Within 3 To 4 Weeks Of Order Confirmation And Receipt Of Payment. All Our Jewelry Is Handfinished By Some Of The Best Jewelry Craftsmen In The Industry. All Gemstones Are Custom Cut. We Have Some Of The Strictest Quality Check Standards And Goods Are Inspected At Every Stage Of Production. We Therefore Request This Time To Create Jewelry That Has Been Admired In Over 17 Nations And By Over 3,000 Buyers. Shipping Charges Are 25 U.S$ For Shipping By EMS Or FEDEX. You Can Combine Shipping Charges With Other Purchases. 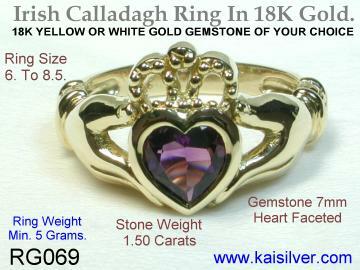 The Claddagh Ring Is Just One Of The Classic Masterpieces Created By Kaisilver. Some Of The Worlds Best Jewelry And Gemstone Craftsmen Make This Claddagh Ring The Best Rendition Of The Irish Ring Ever Attempted. Join Our Mailing List To Stay Updated With More Developments And Products.